With October officially upon us, I'm sure you've all begun to notice the Halloween candy popping up in store windows like I have. Personally, I'm a complete sucker for a good Reese's peanut-butter cup—which is exactly why I took to the kitchen this week to create something that tasted just as indulgent but was much better for me! 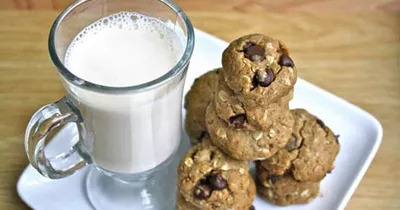 When I came upon this recipe for Oatmeal, Peanut Butter, and Chocolate Chip Cookies, I knew immediately that it would serve as the perfect base to create a sweet treat that would satisfy my candy craving without the added fat and sugar. Using the following substitutions, I was able to take a completely decadent cookie and turn it into a delicious treat, making it the perfect Reese’s alternative! The agave substitution made these cookies super-moist, which created a great contrast with the hearty oats and whole-wheat flour. Perhaps best of all, however, was that both the chocolate and peanut butter flavors really came through, making this cookie a total winner in my book!